Mae Karthauser is a songwriter with a rich, acrobatic voice and a distinctive circusesque piano style. Raised in a musical family and one of seven children, she began learning piano, violin and singing as a child, before going on to study at Dartington College of Arts and California Institute of the Arts in LA. Her training began classically, but quickly spread to music spanning Eastern Europe, Bulgaria, Africa, North India and Java as well as in jazz, folk and more popular modern styles. She has performed her songs in France, Austria, Italy, Spain, Belgium, Sweden, Norway and California and experiments often with contemporary circus – she has played whilst harnessed off the edge of BBC Television studios, dangling from the side of an old English fire engine and whilst flying tandem over the French alps in a paraglider. 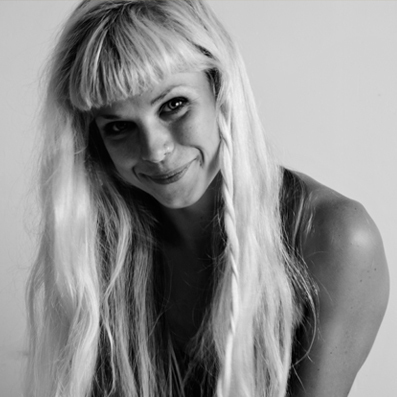 Mae has worked with circus companies such as Svalbard Company Sweden, Gratte Ciel and The Flying Frenchies (her music appears on the film “Petit Bus Rouge”). She has recorded three albums and performs alone and with “The Midnight Fairground” band.